In the 21st century, tablets have become one of the leading instructional technology devices used for instructional delivery in K-12 schools. The emerging use of tablets in K-12 schools include iPads, Android, Google Earth, Diigo, Blogger, GRiDPad, Modbook, iPhone, iPod, Kindle, Nook, Web 2.0 tools, Google Apps, iBook Author, iTunes U, the Apple iPad 2, Kindle Fire, Asus Nexus7, Galaxy, and smart board. Integration of tablets used in K-12 environments has proven to help students navigate their own learning, but its impact is not fully utilized in classrooms. It is common for students to own and use tablets in the teaching learning process because they are empowered to navigate, strategize, and create avenues for self-directed learning. Yet to date, not much is known about the increasing uses of tablets in the classroom setting, instructional implications on students and teachers, and its challenges in K-12 schools. 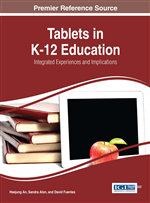 This chapter addresses the emerging trend of tablet usage in K-12 schools, benefits of tablets in K-12 schools, instructional implications of tablet usage on student learning, and challenges facing teachers with regards to the use of tablets in the classroom. Recommendations for future studies and a conclusion are discussed. According to Horizon Report (2012), technology is seen as a means of empowering students with regards to means of communication and socializing. It is impacting all of our lives, particularly students in an unprecedented and expanding ways. The physical space in the teaching and learning environment is changing to include the process where teachers engage students in a virtual space with technological support such as the use of tablets, mobile learning, and distance or blended learning. The changing process has pedagogical instructional implications for both teachers and students. The emergence of new instructional technologies in K-12 classrooms (iPad, iPod, and smart boards) offers the potential to help students become digital learners that allow them to be self-directed, and independent learners (Project Tomorrow, 2012). It is evident that instructional technology in the form of tablets use is transforming when, how, and where students can learn in K-12 environments that is commonly referred as iGeneration, digital natives, net-gens, millennials, or generation tech because today’s students live in a world that is connected to digital technology (Rosen, 2010). The use of tablets in the classroom has shaped the way students at all levels in K-12 schools learn, think, read, socialize, and interpret information in the teaching learning process (Learning & the Brain Conference, January 10, 2011). Prensky, (2008) affirmed that about 65% of teachers in K-12 schools agree that educational computer games could help engage students while 46% prefer training on technology integration into their teaching and 11% of these teachers use technology in the classroom. It is estimated that by 2014, about 90% of the population in the U.S. will have access to high speed Internet networks and the majority of students in K-12 schools have access information online several times within a day (Lenhart et al., 2008; Macgill, 2007). To support this assertion, Arne Duncan, the U.S Secretary of Education made a statement that “digital transformation” is occurring in our nation’s schools; U.S. is moving from a predominantly print-based classroom to a digital learning environment” (November 9, 2010). It is therefore no secret to acknowledge that students in K-12 schools have used and applied new technologies particularly tablets technologies to shape, enhance and address specific learning goals. For example, the use of mobile devices in the form of iPhones has helped students to retrieve information for their schools work and communicate online with their peers as well. Table 1 shows students’ access to personal and school provided tablets for students at the K-12 level. As reported on Table 1, students had more access to personal tablets than school provided mobile devices due to lack of resources in some school districts.